But instead of the crystal, a DIP8 TTL package. I also want to build one for 75 Meters for use as a 10 watt QRP TX for when I get my General at NearFest X.
I figured it might be simple to series modulate the final and use an external audio amp for audio source. Would appreciate some help with the design. Of course, for the BC band version, I'd limit input power to 100mw in observance of FCC regs. Would appreciate any help I can get and I know there's some *very* knowledgeable folks here. Sorry the graphic didn't seem to work... stupid Anglefire hosting.... so I copied the circuit to my own webserver and linked it from there. Someone's gotta know a few suggestions??? I am not an expert at all on this. Perhaps if you were more specific about what exactly the "TTL oscillator" consists of, either the circuit or part number? Also there are now a number of DDS chips available that do this and more... kits even. I think the biggest issue will be getting rid of the unwanted carp that may come forth from the "oscillator". The 1MHz version, I wish to just use the oscillator since that is fewer parts and less money. I plan to clean up the square output using an LC Tank to create a sine output, then buffer the resultant sine before heavily filtering out harmonics using a high Q filter. I just need help with the design process. I'm told this is where the AM experts are. You could "bend" a 4 MHz crystal about 5-10 kHz before you lose the stability of the crystal or oscillation stops all together. ok, thanks for your inputs. I'm open to suggestions to make this with my 3 goals stated above in mind. The idea is to design a transmitter that is cheap and easy to build... it does not need to put out a lot of power, just a dozen watts or so to get on the air when I get my general privs in a couple weeks. I've been enjoying the AM'ers on 3875 a LOT! listening on my Realistic DX-440 (yes I need a better receiver, but it works for now). I hope to someday assemble a better station, but for now just looking for a simple start. The 1MHz transmitter is just for some fun to toy around with - playing some internet radio and old time radio on my RCA Strato-world receiver. I'm really looking forward to joining up on 3875khz soon! I do not think this circuit is going to work. But that is the least of the issues. The power levels you are talking about, assuming you will not be using a amplifier, are going to be just to low to use on 75m. Unless you have a killer antenna (something like a dipole, balanced fed, at 70'+ in height) you're just not going to be heard very well at all. IF at all! I know it's fun to build and experiment, but don't rely on small transmitter to get out on the low bands and be your primary communication radio. It's just frustrating. The time spent will not realize anything other than a working curiosity, and not be anything useful for communication on 75m AM. You would be better served by some inexpensive BA (boatanchor). They can be had, in working condition, relatively on the cheap. Or if you need to build, look into the Class-E stuff. Easy to build, high power and known to work (proven performance)! You can even build a small one, say 50W carrier, and be heard well. But good luck with the circuit. Well not AM I use a TTL osc for a crystal spotter and have for several years. It works well. I use variuos chips , right now I beleive it is a 7400 or some version of it. I clip the crystal in the holder (two small alligator clamps) push the button and set the receiver. I run a Vintage station and use regens for recvers ) I pop the crystal back in my transmitter and I am in busness and right on frequency. I did build a qrp transmitter once with the same circuit but a power transisitor final. Still have it. Built in a wooden Tea Box. I called it "Tempest in a teabox" Biggest problem with all these circuits is low power. Low power is fine of you live in an area with nearby towns and a decent ham population but here on the north shore of lake ontario you can were out a lot of batteries waiting for an answer. I would think you would need 4 stages at least to get decent power at all. I was trying that but got back into tubes and radios that glow inthe dark and the ttl stuff and solid state is now gathering dust. Still I would encourage you to give it a shot. You have to make a certain amount of smoke in you carreer as a ham. Tis the best way to learn. If you believe you have a workable idea give it a shot and see how it turns out. Use a dirt simple Hartley oscillator using a couple of transistors. This is what I use - it's simple, simple, simple. If you want to get more sophisticated and make a better VFO, operate the oscillator at twice the frequency (about 7 mHz if you want to get on 75 meters) and divide it by 2 using a J-K flip flop. Then you can leave the oscillator running all of the time, and just turn on the flip flop when you transmit. This system will be MUCH more stable. Here is a schematic. As you can see, there are few parts. The flip flops are both in the same DIP package. You could eliminate the relay (and relay driver transistors) and the circuit that drives an external frequency counter if you don't want these. You can buy an Epson TTL programmable clock oscillator (SG 8002) for $6 or so from DigiKey programmed for any frequency you wish with a standard TTL output. You can drive a small Mosfet (2N7000 or equal) with it or drive a small Mosfet driver IC (Microchip make a good cheap one that is used in the Retro 75 and 40 )) and drive a medium size Mosfet. Either mosfet output can be driven in class D or E for a very efficient CW transmitter or drive the final with modulated DC and get AM out. I have found the Epson chip to be excellent and very stable. I have one running a 22 meter Hifer beacon and the frequency has been measured against WWV - the chip is 13.554 Mhz and it was measured at 13.554004 Mhz in Kansas. I am transmitting in SC at 4 mW. The Epson chip is half the price of a custom crystal and it ships in one day. Those things look pretty good. How is the phase noise? My [limited] experimentation with these sorts of devices has shown a lot of phase noise (an unacceptable amount for anything high power), but there are much better chips out there now. How is the Epson? Run it through a 14013 flip flop which divides the frequency by two or four and drive the transistor through a 4049 with all sections in parallel. The phase noise is not good, but it depends on frequency. I wouldn't use it for anything over 10 watts or so. They are pretty stable though. Cheap is the key - DigiKey has them for $5.10 from 1-150 Mhz or so. Way better than a crystal and dividers for simple stuff. My QRSS3 beacon uses one at 13.554 and I use the output enable (pin 1) driven directly from a PIC12F509 and chirp is not a problem. I run the output into a PC mount 100 ohm pot and then drive a 7 pole 50 ohm filter. I get variable power from 0-10 mW. I run the beacon at 4 mW into a ground plane antenna - Best DX is ME from SC on the first day. I think your question more specifically is, "Can the output of a digital (square wave) oscillator be used as an RF signal source". The answer is yes, provided you pass that signal through sufficient stages of low pass filtering to eliminate the unwanted harmonics. Many quality signal generators, even starting with relatively clean sinusoids use many levels of filtering before deriving the final output. 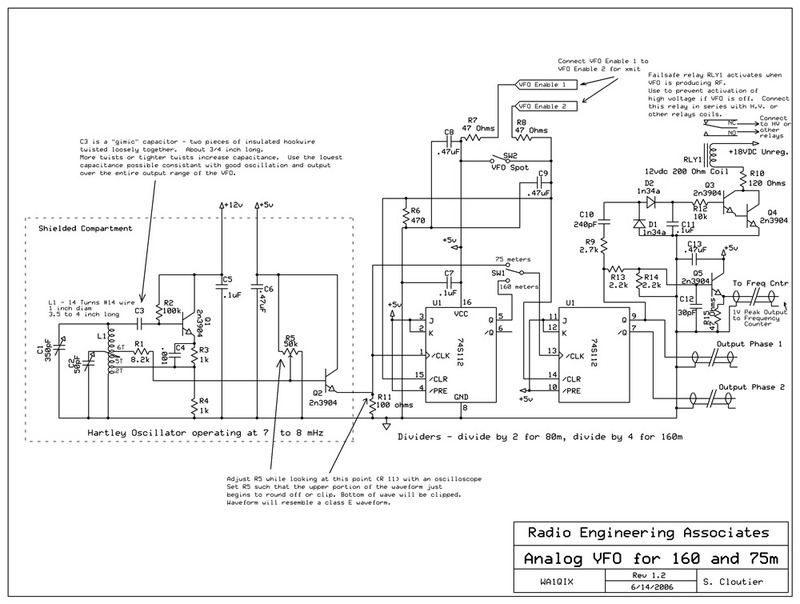 You'll note that Steve's VFO, which is a tried and true design, uses logic circuits at the output. However, this is intended to drive a Class E stage where logical on/off is the desirable feature. If you want to drive a conventional RF stage you may consider taking the output of Steve's VFO before Q2 and buffering/filtering from there. Light coupling into the filter stages helps selectivity but should be done inductively. The capacitive divider shown in your circuits output will favor the higher harmonics. See you at NEARFest and good luck on the test. A square wave doesn't really need all that much filtering to clean it up nicely. An unfiltered square wave harmonics drop off at 6db per octave and there are no even harmonic components. That means the 3rd is down 12 db and the 5th is down 24db. A real simple 50 ohm 5 pole filter will take the 3rd harmonic of a 3.5 Mhz square wave down 30 db and the 5th down over 60db. That is a pretty clean sine wave with three caps and two small toroidal inductors - adding 2 more poles (another cap and inductor) really cleans things up. A resonant antenna cleans it up even more. Steve uses a novel circuit to vary the duty cycle of the square wave drive in his VFO. I have used it in a class E Medfer beacon and it works very well. I agree, there is basically no need to do any filtering along the way. Keep it square all the way into the Class D or E final and clean it up with a serious post filter. This also will yield the best efficiency. Ok them I have a question then. If you filter post, how are you measuring amplification efficiency? Broadband or only the operating frequency. If the Class D or E circuit is passing and amplifying all the harmonics and the fundamental wouldn't that skew the efficiency? Make it appear higher, in other words. Also it seems to me you would be using available power to amplify harmonics that never reach the antenna. Isn't that power wasted in filtering? Also wouldn't the filter design need to be substantially larger to handle the power. Why not simply pre-filter? I'm asking because I don't know. Don't think of the final amplifier as an amplifier, think of it as a switch. The less time that the switch is in the linear region, the better the efficiency, so fast switching as with a square wave will yield the most power. Yes you will lose the power of the harmonics, but we only want the fundamental anyway, and the loss is fairly low even when you combine all of the harmonic energy. I apologize if I missed something but is John attempting to build a Class D/E transmitter or a conventional Class C transmitter? In either case I agree with all the previous postings, just not sure what the application is. Aside from the FET final shown in the first post it's not clear to me what Class is being pursued. I initially assumed Class C.